Don’t miss Kenninghall Morris who will be dancing outside the Cross Keys. Motorcycling enthusiast? Following a highly successful motorbike meet at the pub last year, we shall be holding monthly meets this summer, on the 3rd Saturday of each month, May to September, commencing on Saturday 18th May. 12noon – 3pm. So, if you have a motorcycle please bring it along or, if you are just interested in bikes, come along and meet the bikers and check out their machines. The final frames are being played this coming Sunday afternoon, commencing at 2:30pm. Come and support…..and enjoy a drink at the same time. Don’t miss him! Alfie @ the Keys on Saturday 27th April. Come and join a great night of music and karaoke! Get yourselves booked in and your fish & chips order placed! IT’S BANK HOLIDAY AND WE’LL BE OPEN FROM 12NOON! We’re hoping for dry weather as we get the barbecue season underway. Come and chill out, enjoy one of our home-made burgers and let the kids have fun on the BOUNCY CASTLE. There’s going to be plenty going on to keep all the family occupied at the Cross Keys on Easter Sunday. At last! An advantage to age! The Cross Keys is introducing a keenly priced MID-WEEK LUNCH for our silver surfers. Every Wednesday, starting WEDNESDAY 3RD APRIL. We’ve got our next Quiz Night on WEDNESDAY 27TH MARCH. Don’t forget to book your food in advance if you’re wanting some. Please arrive in plenty of time for a prompt 7.30pm start. 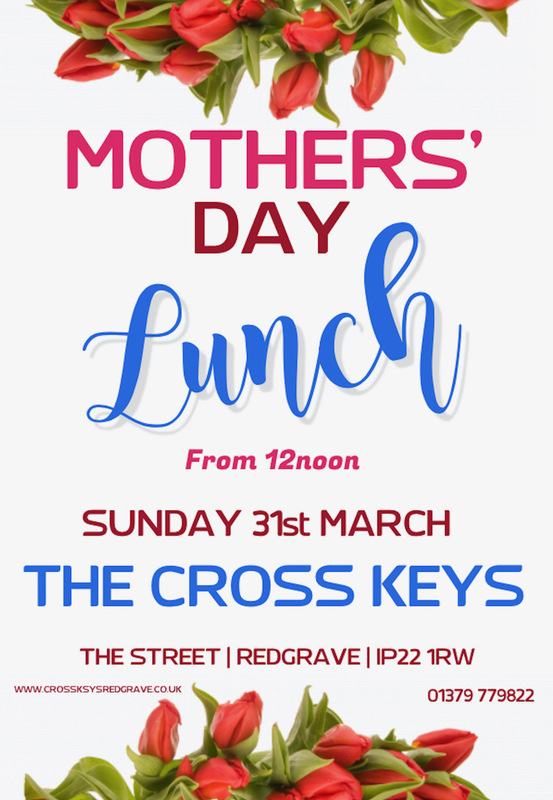 Why not treat the special Mum in your home to a delicious lunch at the Cross Keys? Give her a break and let her enjoy Matt’s cooking in our warm and relaxed surroundings. Please reserve a table in good time. Enjoy playing cards or board games, or happier just having a chat and catching up with friends? 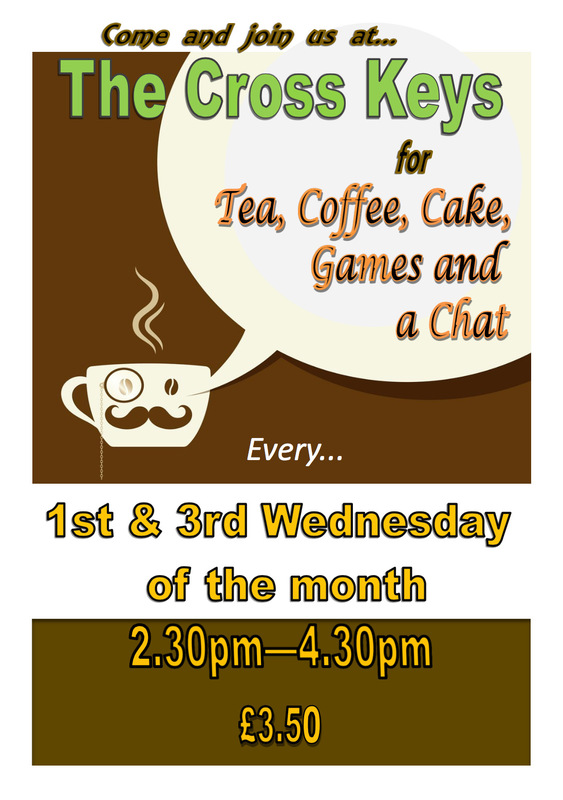 Either way, come along and enjoy a great afternoon with a slice of delicious cake and a cup of tea or coffee on the first and third Wednesdays of each month. As well as a lunchtime celebration, we’ll be partying into the evening with a 60s / 70s disco. Although certainly not obligatory, outfits of the era would be appreciated! 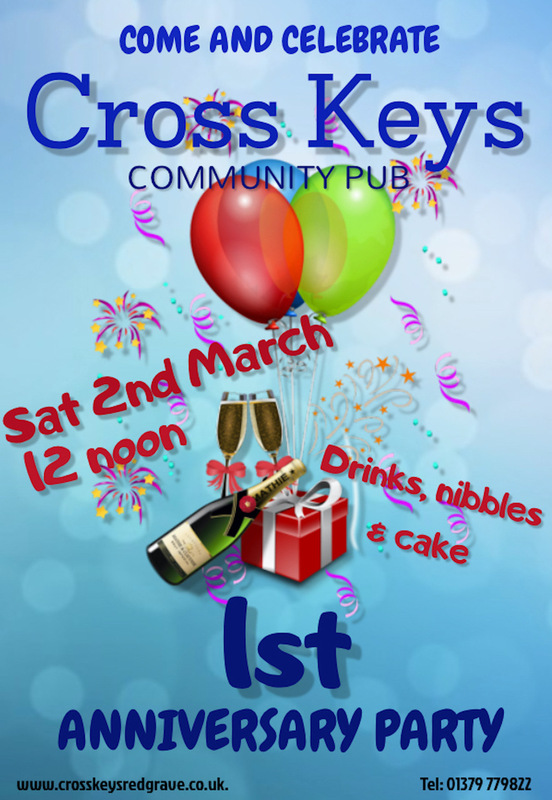 In recognition of having been trading as a community pub for a year, everyone is invited to come and join us for a celebratory drink on Saturday 2nd March at 12noon. The press are hoping to come, so we’re hoping lots of you will be able to make it, too. Six Nations Rugby matches will be shown live in the CrossKeys between 1st Feb and 16 March. Come along and cheer for your favourite team with a drink or two! Selected Beers and Wines will be on promotional offer during live matches. Another of our popular evenings hosted by Bernie Cresswell. Come and try your voice at singing or be entertained by our own home-grown talent!! New at The Cross Keys – an Open Mic Night hosted by Bernie Cresswell. If you’ve got talent for singing, dancing, or are a bit of a comedian, then come and entertain us! It should be a fun evening! That special day for lovers is just around the corner. Why not relax and enjoy a special candlelit dinner in the cosy surroundings of the Cross Keys? Tables available at 6pm and 8pm. Please book early to reserve. A light-hearted and entertaining evening, with advice/education from James Ramm on a variety of wines and the food they complement. James is a Redgrave resident and works for Greene King. Places are limited so please book your £10 ticket in advance. Fancy a cosy afternoon in front of a fire? Have a chat and possibly play a game or two? So….get the date into your diaries, head on down to the Cross Keys and just come and enjoy yourselves! Every Monday 6:00pm – 8:30pm, our popular Curry Night. All curries will include papadums and chutneys for only £10 each, drinks not included. Please note, only curries are available on a Monday evening. Quiz Night is the last Weds of each month, led by the ever popular Ian Shepherd. The quiz starts at 7:30pm and tapas are available at £4 each.